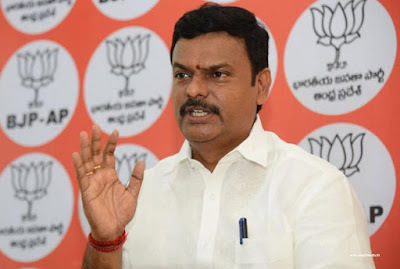 AP MLC Madhav criticized the BJP leaders as their enemy and said that AP chief minister Chandrababu Naidu's son and minister Nara Lokesh. Talking to the media in Visakhapatnam on Wednesday, "TDP leaders can not tolerate if someone criticizes Mahanadu. Ramana commented that the guilty misadventures were put down to the counter-attack. The Dalai Lama city is being developed in the industrial area of ​​Gujarat, claiming that central funds have been diverted by the accused. It has been propagated by false propaganda and it is going to be a public partnership. Clearly, there is no single paisa from central funds. Chandrababu said he was saying that he was a senior and surprised that the authorities had suggested that the state be reduced to temperatures. In the 2019 election, Chandrababu voted to insult the Telugu community. The names of Chandrababu and Lokesh are being heard on Visakhapatnam scam and the SIT's inquiry was completed and the report was asked why the report was not being disclosed to the government. In this, the Minister demanded that the followers of the Sankarwas are followers and demanded that the report be immediately disclosed.